These reptiles and birds were photographed by us near the army base and quarantine station on North Head, Sydney Harbour. 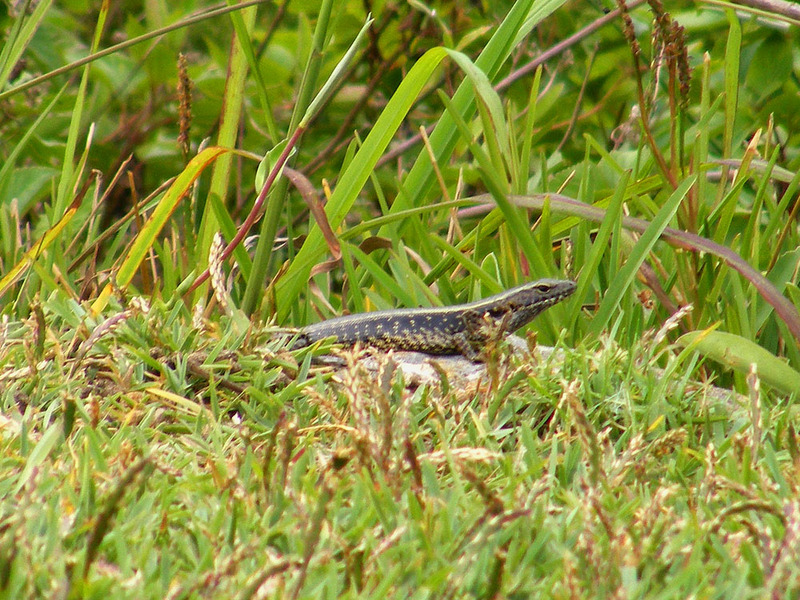 Eastern Water Skink Eulamprus quoyii is a medium sized skink which grows to about 30 cm long. It is abundant and widespread. The species is named after the French surgeon and zoologist Jean René Constant Quoy. He served as the naturalist on the Uranie, under Louis de Freycinet and later on the Astrolabe, commanded by Jules Durmont d'Urville, between 1817 and 1826. As well as discovering many new species of birds, reptiles and plants he was much admired for his scientific illustrations. New Holland Honeyeater Phylidonyris novaehollandiae is often to be seen in the eastern coastal scrub. This one is sitting on the dead flower stem of a Grass Tree Xanthorrhoea sp. In the background is Dobroyd Head. 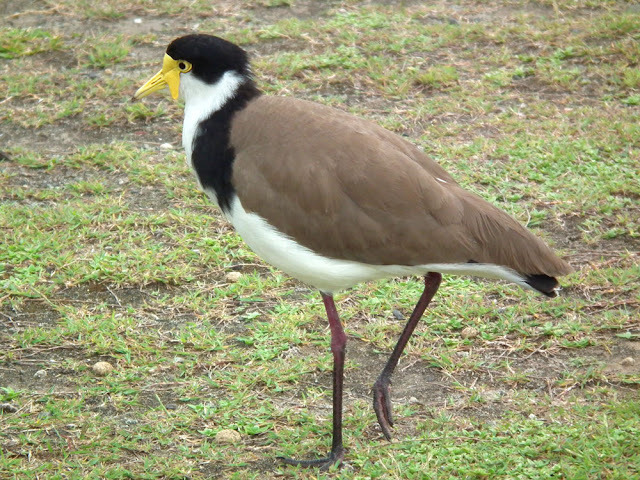 Masked Lapwing Vanellus miles is another species first described by a Frenchman, this time Georges-Louis Leclerc, Comte de Buffon. He included it in his 1781 book on the natural history of birds. 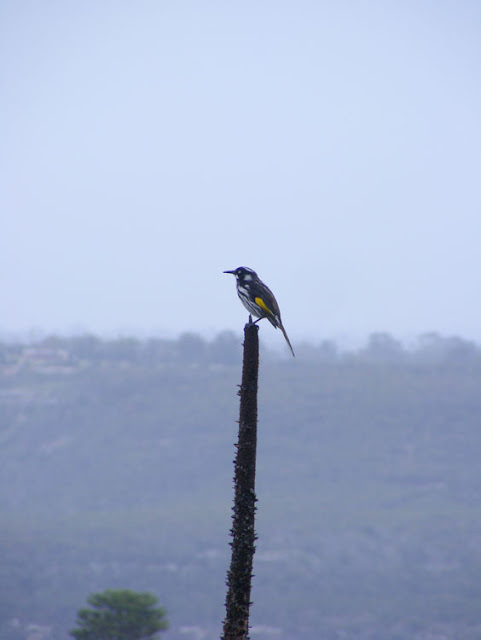 The bird is common in open areas and has a distinctive ringing call that all Australians will recognise. They will often nest in schoolyards and sports fields, on the ground, and terrorising the locals with their defensive diving. Australian Water Dragon Intellagama lesueurii is yet another Australian species with an association with a French scientist. We saw them last time we visited Manly. They are named after the naturalist Charles Alexandre Lesueur, who accompanied Nicolas Baudin's voyage of exploration around Australia. These lizards can reach 60 cm long. Is the Water Dragon a distant relative to the Komodo Dragon ? No. 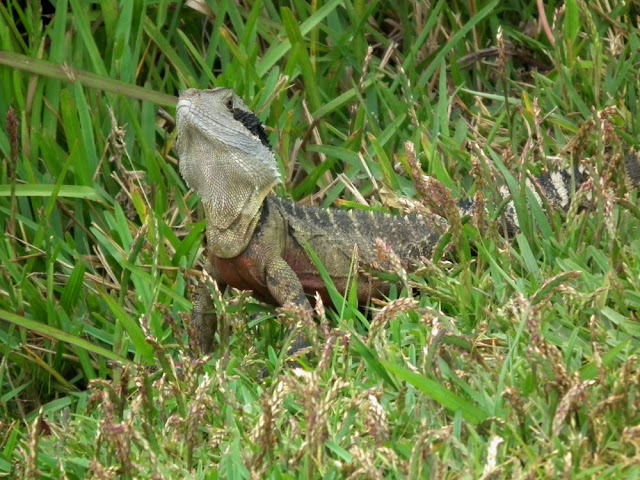 Water Dragons are Agamids, Komodos are Varanids (like goannas).